On behalf of the Organizing Committee we are pleased to invite you to CSI Asia-Pacific on January 31 - February 3, 2018 in Ho Chi Minh City, Vietnam! 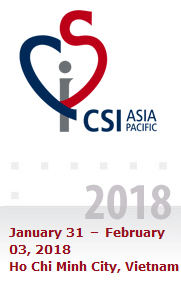 CSI Asia-Pacific 2018 will be a joint meeting with the Vietnam Congress of Congenital and Structural Heart Disease and is organised by the CSI Foundation and the HCMC Pediatric Cardiology & Congenital Heart Disease Society. The meeting will give a comprehensive overview of major topics in catheter therapy of congenital, structural and valvar heart disease and is designed for adult and pediatric interventional cardiologists, cardiothoracic surgeons, anesthesiologists, imaging specialists, nurses, technicians and any other medical specialty involved in these procedures. It will also provide opportunities for engineers, device design specialists and inventors to learn from and network with physicians. The program will include lectures from leading experts in the field, live case demonstrations, hands-on simulation training, master class sessions and an industry exhibition. The first day of the meeting will be dedicated exclusively to PDA from A to Z, including imaging, PDA closure and stenting. During the following days we will cover an array of topics supported by live case demonstrations from multiple centers around the globe.